As a property owner, you love the look of a freshly watered lawn. You rely on your sprinkler system to irrigate your yard, keep your flowers colourful and spry and make your property look its best. 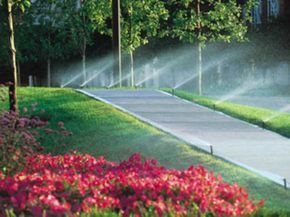 At Victoria Garden Sprinklers, we install and maintain automated sprinkler systems for Victoria homes. Turn to us when you need a system that will help your lawn stay green with minimal strain on your time and resources. An automatic sprinkler system irrigates your lawn or garden based on a timing system. An electronic controller determines when your system's valves open and close. This then controls how much water reaches each part of your yard and at what time of the day. How Do I Use an Automatic Sprinkler System? After installation, the only thing you need to do to operate your automatic sprinkler system is set the controller. Determine what time you want to water your lawn and how much water you want to use. The controller takes care of everything else. Most electronic controllers rely on a 9-volt battery to operate in case of a power outage. Make sure you change your battery at least once per year. Why Should I Choose an Automatic Sprinkler System? When used correctly, an automatic sprinkler system benefits the environment and your wallet by saving water. Program the controller to provide a water amount that corresponds to different seasons, the types of plants and grass you have and the time of day. This way, you'll never overwater or underwater your lawn. How Can Victoria Garden Sprinklers Help? Since 1981, our family owned company has helped businesses and homeowners in Victoria beautify their property through landscaping and sprinkler services. When you feel ready for your own convenient sprinkler system, Victoria Garden Sprinklers will help. Contact us at 250-652-0442, or complete our online form.